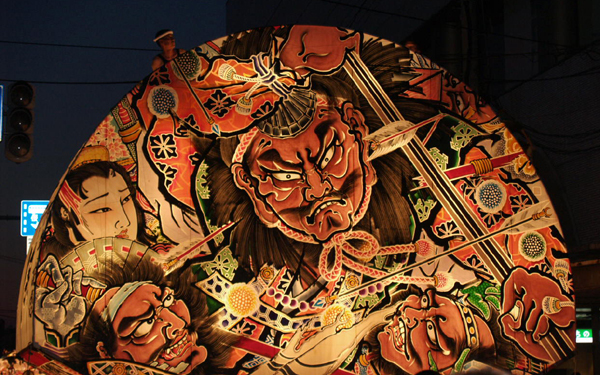 The Neputa Festival of Hirosaki, in northern Japan, suffers from being overshadowed by its more famous sister festival, the Nebuta Festival of Aomori City. Even many Japanese have never heard of it. 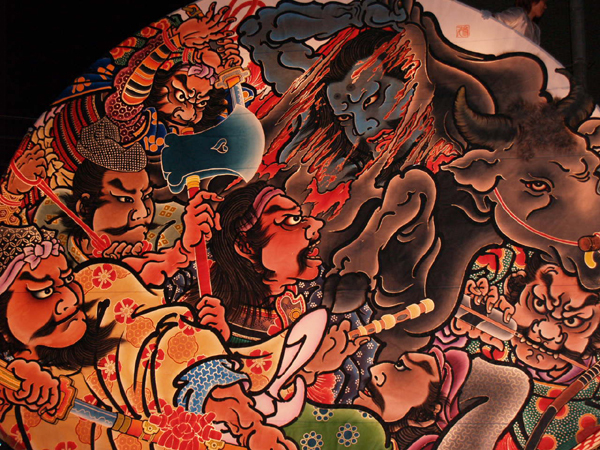 Many think the word “Neputa” is just another word for “Nebuta” or a slip of the tongue. This is unfortunate because the Neputa festival is worthy of recognition in its own right. 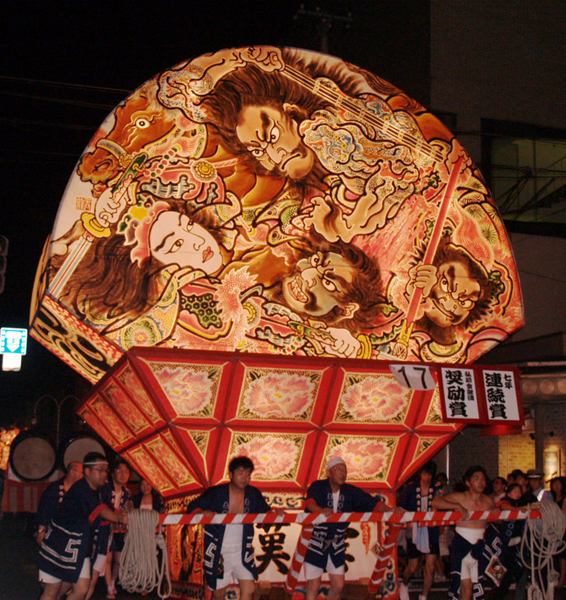 The first recorded Neputa festival goes back to 1722 but the festival itself is no doubt older. 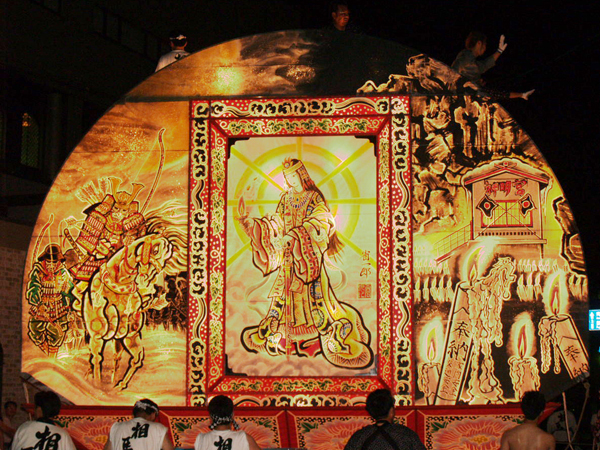 The Neputa festival has been named an important intangible national cultural heritage custom. 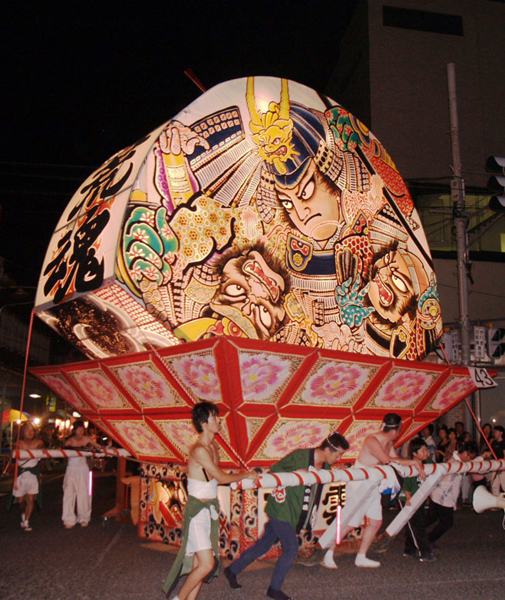 The traditional floats of Neputa are not the three-dimensional ones like those of the Nebuta Festival, though some of those type floats are used in the procession. The Neputa floats are two-dimensional large flat fan-shaped floats with paintings on both front and back surfaces. 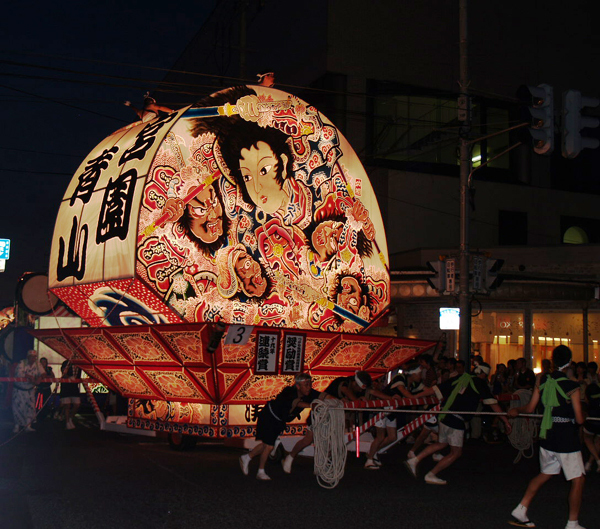 Like Nebuta, the floats are illuminated by light bulbs within the structure. In the Heian Period of Japan (794-1132), Rashomon Gate was said to be haunted by the demon Ibaraki Doji. Once it had been the grandest and largest of the gates of Kyoto but in the decline of Heian society, Rashomon Gate fell into ruin and became the haunt of human devils such as thieves and corpse despoilers. Unwanted dead were often left at Rashomon. In these details perhaps lay the origin behind the demon Ibaraki’s haunting of the Gate. In the late 10th century, a brave samurai Watanabe no Tsuna went to Rashomon Gate to confront the demon. As he waited he grew drowsy and nearly fell asleep. He was rudely awakened before dawn by the hand of Ibaraki which grabbed him roughly from the back of his head. Tsuna cut the demon’s arm from its body and the demon swiftly fled leaving Tsuna with a unique and enviable battle trophy. Tsuna put the arm in a box for safe keeping. Some days later his old nurse and aunt came to visit him. She was most curious to see her former charge’s souvenir. Tsuna could not refuse her request and promptly showed her the demon’s severed arm. All at once the countenance of his old nurse changed into the hideous demon Ibaraki. The demon quickly snatched its arm and flew off never to trouble Kyoto again. A visitor will soon notice that the paintings of the Neputa floats have a distinct warlike theme to them. 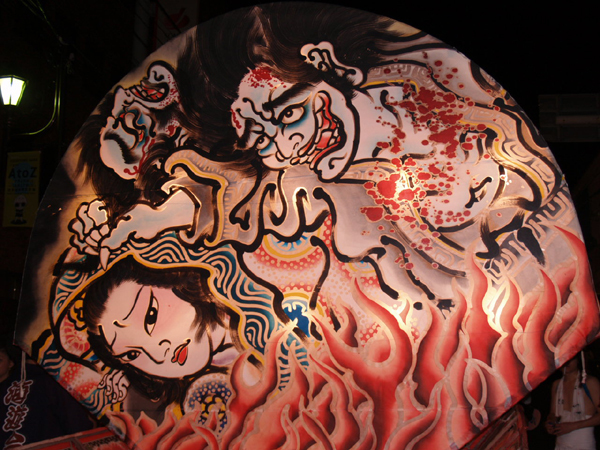 Like Nebuta many of the themes are based on historical and mythical characters from Japanese and Chinese stories. Neputa’s themes appear more violent in depicting bloody swords, grisly baskets of severed heads, brutal beheadings, swallowing of eyeballs, and so forth. On the other side of the Neputa float, however, one often finds a beautiful portrait of a Chinese or Japanese lady in a gorgeous costume. The ladies often appear somewhat melancholy. At certain times during the procession, the Neputa floats are rotated to show both sides rapidly. 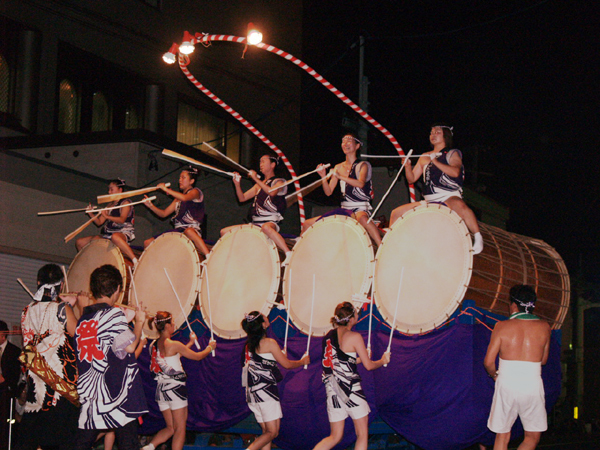 The larger floats are rotated by use of ropes pulled by four to six people while the bottom base remains stationary. The kagami-e is the heroic fighting side and the miokuri-e is the peaceful side often of sad women who are seeing off their brave menfolk. 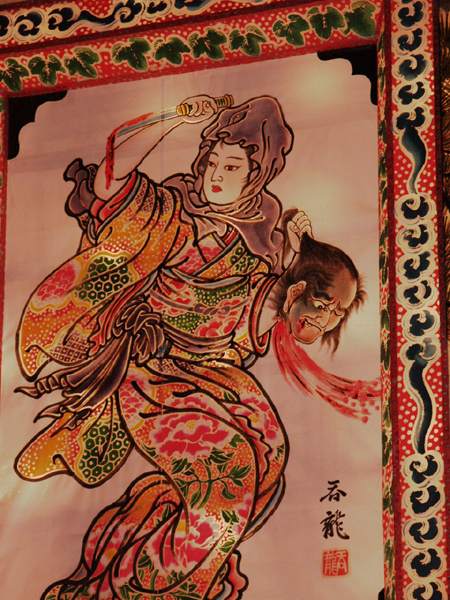 The reason for these contrasting images of war and sad beautiful women has to do with the nature of the Neputa Festival and its difference to the Nebuta Festival. Neputa is said to represent a war procession of warriors going off to battle. The fighting scenes are to steel their hearts and prepare them for the grim task of fighting ahead. The forlorn women on the opposite side represent their wives and lovers seeing them off. Xiahou Dun was a general during China’s Three Kingdoms period (180 AD – 260 AD). In the course of one the countless battles of that time period, Xiahou Dun was struck in the left eye with an arrow. He dramatically yanked the arrow from his eye with it still attached at the end and preceded to swallow it. He shouted: “The essence of my parents cannot be thrown away!” He then promptly killed the warrior responsible for the deed. Xiahou Dun is highly admired to this day for his bravery, his loyalty and devotion to family. His master Cao Cao is not remembered so favorably, however. 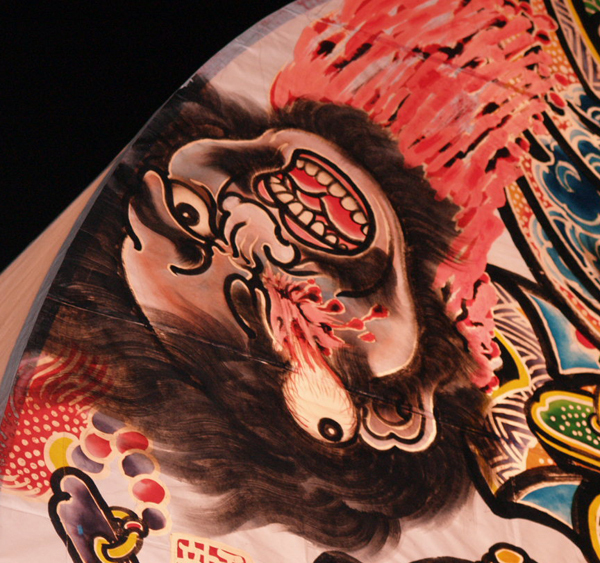 In contrast, the Nebuta Festival of Aomori represents the triumphant return from battle. The music has a more upbeat and merry melody to it. During Japan’s Sengoku Period (Warring States) in the 16th Century, no doubt people witnessed many such processions. Typifying such a war procession, the Japanese Self Defense Force puts in an apt appearance by performing a sword and fan dance. A group of women marched together carrying the long deadly naginata — which is like a combination of spear and sword. 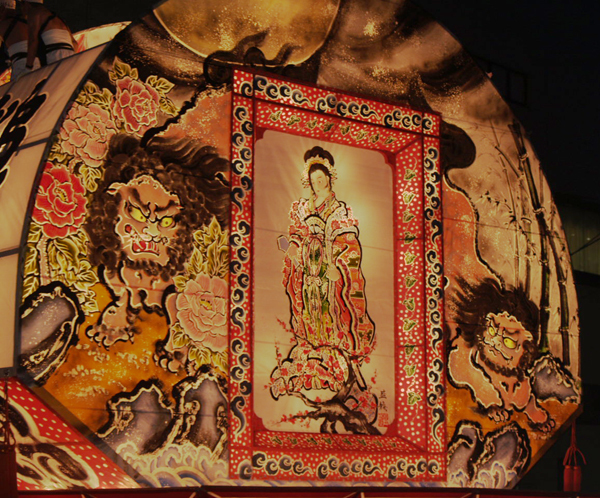 Though Aomori’s Nebuta Matsuri tends to hog the limelight, Hirosaki’s Neputa Matsuri deserves accolades for its impressively beautiful artwork, particularly on the rear section of the floats. 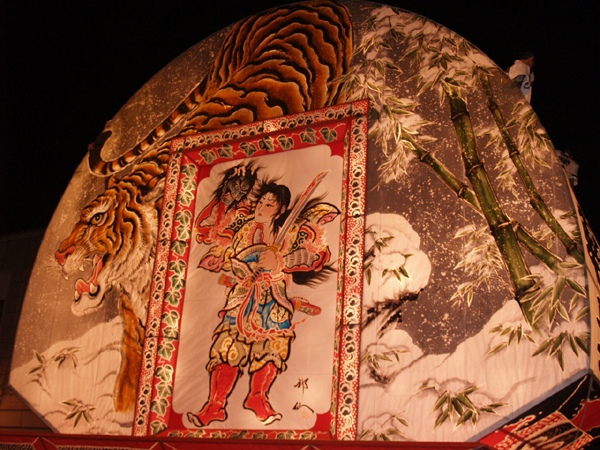 The exquisite artwork of the floats is quite fitting because Hirosaki is after all the capital for culture and education in Aomori Prefecture. In fact, while Aomori was for a long time just a sleepy port town, Hirosaki had been the official capital of the Tsugura clan’s domain from 1603 to 1868. When the Emperor Meiji came to power, he reorganized the area making Aomori City the capital. Being a landlocked city of no military value, Hirosaki was fortunate to be spared the dreadful bombing that Aomori City received during WWII. Ordinarily it might be difficult for visitors to choose which festival to attend but fortunately both festivals last for nearly a week — the first week of August. It’s quite possible and definitely recommendable to see both. The tale of the Vampire Cat of Nabeshima is aptly ghastly addition to the grimmer aspects of the war-like Neputa Matsuri. Long ago the young lord of the Nabeshima clan fell ill under mysterious circumstances. He grew weak and listless. No remedy could cure him and he suffered nightly from terrible dreams. His family decided to appoint a samurai guard to watch over him. Yet every night against their will, the samurai fell asleep while the young lord got weaker and weaker. One day a lowly foot-soldier offered his services to guard the stricken lord. As the high-ranking samurai guard continually failed to remain awake, the foot-soldier was given the chance to prove himself. When the unnatural sleep stole over the other guards, the foot-soldier resisted the pull by an extreme measure. He drove a knife into his leg and twisted it whenever his senses began to slacken. He was awake to see the lord’s mistress enter the room to check on the condition of her love. She was surprised to see the lowly foot-soldier still awake. Soon after, the mistress stopped her nightly visits and immediately the mysterious illness of the young lord and the unnatural drowsiness of the guards dissipated. The foot-soldier now knew who was behind it all and he confronted the culprit in her room. What he did not expect to discover was that the mistress was actually a vampire cat creature which had disposed of the lord’s mistress sometime ago and assumed her image in order to drain the energy from the young lord. The cat creature escaped but was later hunted down and killed. The young lord recovered his health and the lowly foot-soldier was well-rewarded.